Giordano, the brand of quality basics wear, has launched Giordano Typography Tee Design contest which will give as much as P330,000 in cash and gift checks to winners. Open to all Filipino citizens aged 15 and up, the contest requires participants to complete a waiver form available in all Giordano branches. Entries must revolve around the theme “World Without Strangers” and should be designed using Adobe Photoshop or Macromedia Freehand. The contest follows the success of Giordano’s “World Without Strangers”, a hit campaign that highlighted fashion without discrimination. The campaign message was then translated into different messages that included a call for solidarity, messages of peace, open-mindedness, and was quickly embraced by patrons. Participants may submit up to three designs. Entries can be mailed to Giordano Marketing Dept., 170 F. Blumentritt corner Gen. San Luis, Brgy. Tibagan, San Juan City, or can be submitted to any Giordano store nationwide. Entries must be placed in a brown envelope containing two color printouts of each design, 1 CD containing a soft copy of the designs, a photocopy of the participant’s ID showing date of birth and signature, and the accomplished waiver form. Deadline of entries is on June 30, 2011. The criteria for the initial judging are as follows: originality, 50%; creativity and execution, 25%; and theme relevance, 25%. Some 15 entries will be selected and will be showcased on Facebook for online viewing and voting. Announcement of the seven grand prize winners will be announced on July 31. 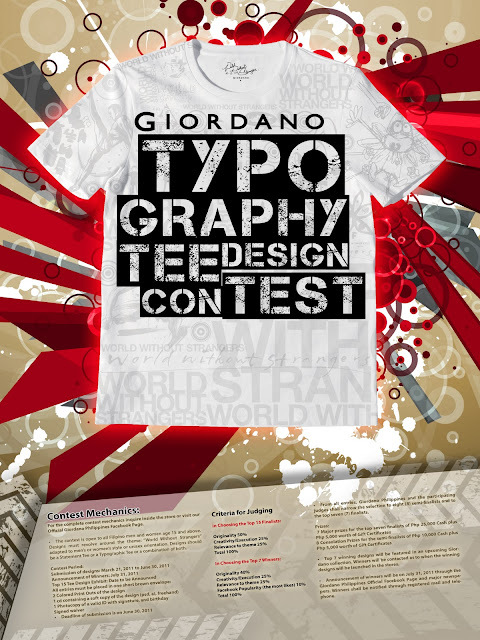 The winners will featured over the Internet and will eventually be displayed in all Giordano stores nationwide. Interesting contest. I'll tell my artistic friends about this.